The tetris game with amazing graphics and original interface. 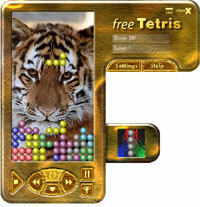 It includes both the standard tetris game and another popular variations of this game. There are 8 levels of the game. The best scores are published in Internet. You can choose the interface of the program, wallpaper on the game area, appearance and form of figures, and create your own figure sets. Also you can change sound schemes. The standard package contains a lot of sound schemes, figure sets and wallpapers. You can easily play the game at your workplace (ESC key quickly hides the program to the tray area (near the clock)). You can find dozens of skins, sets of pictures, and sounds for the game on our site. If you wish, you can create the game of your dream by creating your own skins, sets of pictures and sounds. New! Personal skin for FreeTetris. Unique possibility to order a personal version of the program. We'll create a skin and set of pictures at your will! + it's an "excellent" present for your competitors which will be tortured by the envy. You can use you personal version of the skin at home (and don't show it to anyone) or you can send it to your friends (and enemies) or publish in Internet! If you are interested in our proposal send us e-mail to ftetris@one.com.ua and we answer to any questions!